Born in Edo in 1849. Son of Kawarasaki Gonnosuke VI, he started his career as a wakashugata in the 2nd lunar month of 1859, at the Ichimuraza where he received the name of Kawarasaki Kunitarô I. He became wakaonnagata in the 11th lunar month of 1863, playing the role of Okumi in the drama "Kanadehon Chûshingura". 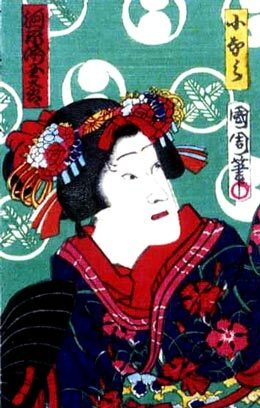 He made his last stage apperance in the 2nd lunar month of 1867, at the Ichimuraza, playing the roles of the courtesan Kewaizaka no Shôshô and Ohaya in the drama "Keisei Soga Kuruwa Kagami". He died in Edo the 21st of 4th lunar month of 1867. Dates of birth and death unknown. He was most likely the son of Ichikawa Tôshô. He was adopted by the actor Onoe Kikujirô II. His first stage name was Onoe Tashô. He took the names of Onoe Karyû (Karyû was the haimyô of his adoptive father) and Onoe Eizaburô (he was never acknowledged as an official member of this line) in the 1st lunar month of 1848 and 8th lunar month of 1863. 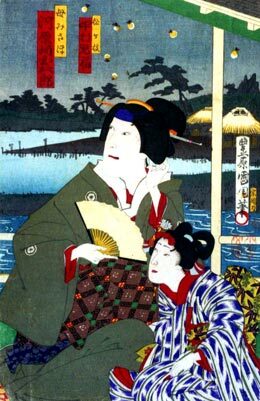 He joined the Kawarasaki clan at the beginning of the Meiji era, taking the name of Kawarasaki Kunitarô II in the 3rd lunar month of 1869 at the Ichimuraza, where he successfully played the role of Yoshitsune in the dance-drama "Kanjinchô"*. He became tateonnagata at the Kawarasakiza in July 1874 but his relationship with his adoptive family quickly deteriorated and he left the Kawarasaki clan in Fall 1875. He temporarily called himself Kawarasaki Kunisaburô during the crisis and finally took the name of Kisegawa Rokô in November 1875. He was active up to 1878. (*) Kunitarô's stage partners were Kawarasaki Gonnosuke VII (Musashibô Benkei) and Ôtani Tomoemon V (Togashi). 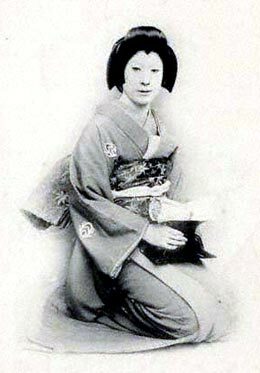 Kawarasaki Kunitarô II portraying Konami in the drama "Kanadehon Chûshingura"
Born in 1853. Son of Arashi Kanroku (later Onoe Kanezô), he started his career in Edo and Yokohama as a disciple of Ichikawa Ichizô III, who gave him the name of Ichikawa Ichimaru. 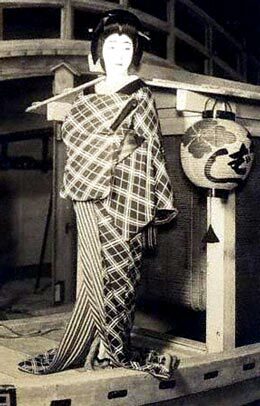 He took the name of Nakayama Ittoku IV at an unknown time (most likely at the beginning of the Meiji era), performing as a wakaonnagata in Tôkyô venues like the Harukiza or the Nakahashiza. He was finally adopted by the Kawarasaki clan in 1875 and was allowed to take the name of Kawarasaki Kunitarô III in September 1878 at the Ichimuraza, playing the role of Osada and Okiku in the drama "Nikaigasa Enoshima Môde". 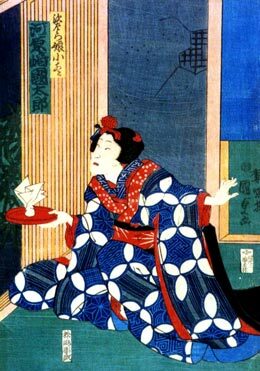 This onnagata, who excelled in sewa nyôbô roles, was active at the Shintomiza or the Ichimuraza up to June 1887, when he made his last stage appearance in the latter theater, playing the roles of Masaoka and Otoku in the drama "Date Kurabe Okuni Kabuki". He died in Tôkyô the 21st of July 1887. The actor Kawarasaki Kunitarô IV held this name from June 1912 to August 1919. The actor Kawarasaki Kunitarô V held this name from April 1932 to October 1990. The actor Kawarasaki Kunitarô VI is the current holder of the name since May 1998.